first time rider report so here goes. 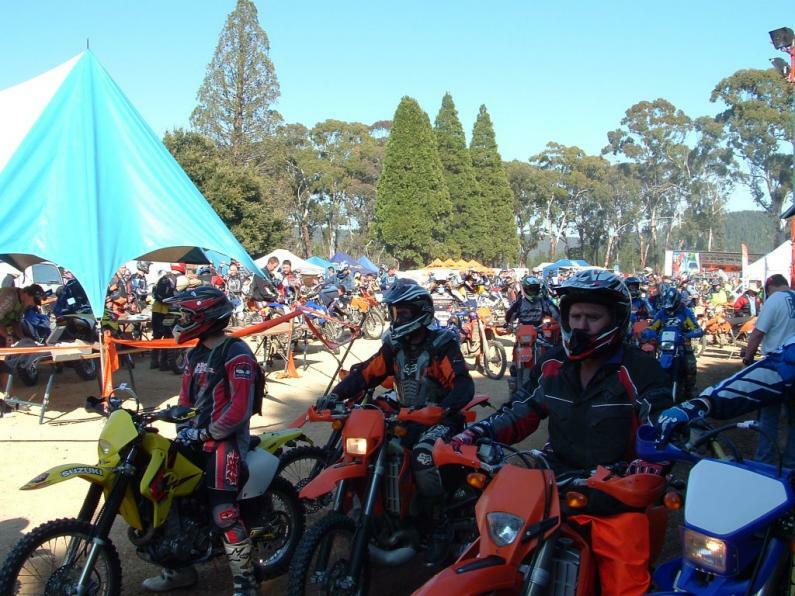 Sunny corner located near lithgow, nsw, Australia is held every year. 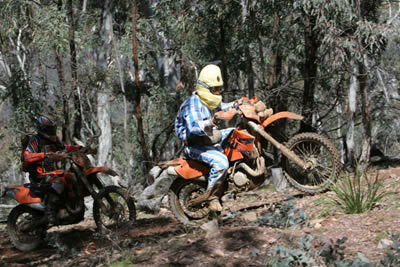 un-sure on the total turn out but i saw some guy with the number 937 so almost 1000. the enduro consists of 2 loops. 1st loop consists of 80km (50miles) and the 2nd loop 50km (30miles). we arrived on the Friday night after a 2 hour with 3 bikes, 1 fridge and itching to get some arm pumping riding in tomorrow. the silhouettes of our bikes glimmered on the wall of our tent as we fell asleep in the negative temperature. we woke to the sounds of the marshals checking the course, love that thumper sound...just need to get an alarm with that 4 stroke sound. small breakfast, fill the tank, gear up and head for the start line. we arrive with 100 riders already lined, wish each other luck and go our separate ways. i sit on the inside of line hoping it would be quicker and push up as far as i can to the start line. they let us through in pairs of 2 as they record our number. finally i get to the front and hear "337, ok go". the first stage was white gravel, lots of dust and lots of reflection from the ground. luckily i was wearing Scott variable tint goggles, they're great. lots of passing the slower riders on the straights and corners. 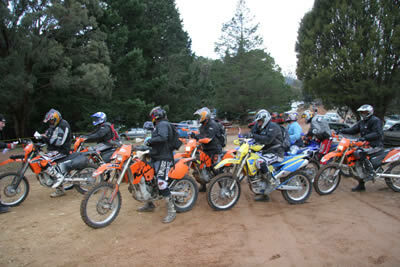 the well arrowed ktm sponsored course so pointed us in to the single track. it weaved around the 3year old pine trees, dam they hurt, there branches whipped me as i rode past at 50k/ph. 30km in to the track i was faced with the choice of the hard or easy section, yesterday i unknowingly rode the hard so i twisted the throttle and powered to very steep single track....im fairly sure it was just a cliff and they put a ktm sticker on it, came out on to the logging rode and hit the throttle hard, no one was around so dust wasn't an issue. doing around 80k/ph i found a off camber right hand corner over crest that almost ended my day, locked the wheel and came with in half a metre to going over the edge. 500m of fist size rocks on one of the steeper hill i have climber. 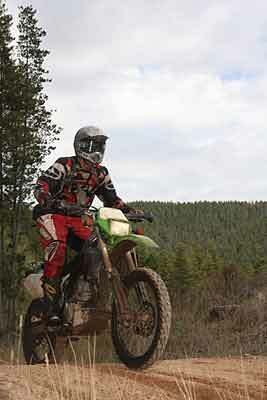 a 2 stroke had parted me just before i started the climb, little did i know that he had got stuck 15m up the. 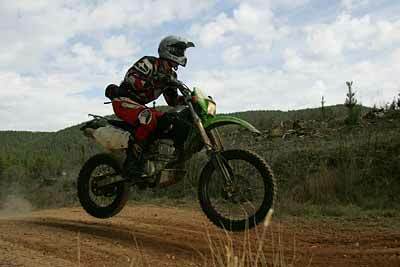 past him, the hill was so steep my bike could not hold second gear! i powered up the hill as the back slid on the rock covered hill bouncing off roots . came to last section of the and was greeted with a single man film crew recording the action. fast forward to the next hard section. steep down hill section i was pasted 2 450's. came down to the bottom of the hill, large brown murky puddle was awaiting us. the first 450 tried get around and got stuck, the second carefully waded through the front fender deep water only to get stuck on the only passable track after just after the puddle. my turn, i plowed through the puddle to make up some time, water flew over my head and then i saw that the 450 that past me has got stuck in front of me, i look to the left throttle on and slip and slide around the side of the track to get past him. next hard section arrowed me into the tightest and steepest single track i have ever ridden. the newly formed track snaked down and around the side of the mountain bring me down into a creek. 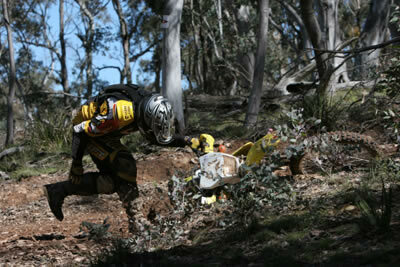 by this time it was 1.5 hours in to the enduro and the steep decent was burning my for arms like nothing else. i passed a couple of riders who had stopped out exhaustion from the last stage, i pressed on. i pasted a guy with a pink wig on his helmet who had just fallen of his bike. he started behind me, i quicker in the single track and extended my lead. we left that single track for fire trails, thank god, the fire trails . his 450 out powered me up the hills. we come out to open logging tracks where i could see his pink wig even through the dust. the come back was one. i remember this logging track from the ride the day before and closed the gap to 10 seconds. i was close. last 100m i knew i had to make my move but the last 2 hours had taken its tole. the last jump had photographers to blind me. the last section went across some year old pine trees, he was quick and i couldn't catch him, i saw the finish line and was so happy it was over and disappointed at the same. i finished in the top 30 riders out of 1000 riders. i was happy with my performance with a comply stock klx 250. soon i will have the 351 kit, pipe and carby with the suspension a bit harder. Top job mate. Aussies are mad of the tough stuff. some pics from earlier years i get some from this year soon. too busy riding to take them my self. Location: West By God Virginia! I could almost see it as i read. Sounds like you had a blast, congrats on doing so well. Nice report as well. Cheers. 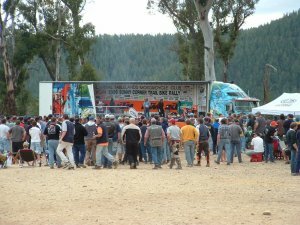 I reckon I would come within 30 out of a 1000 riders easy. 30th from the back that is. Last edited by neilaction; 09-22-2009 at 12:23 AM. so many time i came close to riding into trees and off cliffs im surprised i did, some of the section i had to slow down and relax just because i was pushing to hard. when 2 or so hours after i finish i went down to the finish to watch some of the finish before we packed up. 6 ambulances we there, i have never seen so many in one place. i know 1 guy was unconscious and couple of riders had to be recovered because of injuries, ad least 20 people broke arms and collar bones and some guy broke a leg. still have smile on my face from it and pain in every mussel. i killed my battery as well, finished the event parked the bike, had some lunch found my mate who finished 30mins after me, about to ride back to camp, turned the key and nothing...no light..no neutral light, not even break light. roll started got back, after some head scratching eventually found that the metal tabs on my globe had bent back on themselves and the positive was short circuiting so i never did the 2nd loop because i didnt want to stall at a bottom of a hill and be stuck. Hi from sunny South Africa! All times are GMT. The time now is 09:02 PM.